Do you want plans for the Swappable "scottfire"? This is the "scott-fire Swappable airframe, Named after Josh scott and is commitment to learning such a great hobby! I have come up with a Warbird style scratch build air frame that accepts the swappable powerpod. Its a 30inch Wingspan, with detachable wings so there is potential for alternate wing styles. 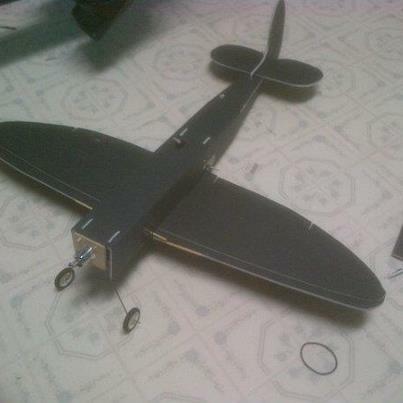 The main fuselage is about 24 inches long currently but i think its a but too long as on 2S its almost impossible to loop, on 3S not a problem. this uses the first powerpod but will be a rocket with the next size up used in the baby blender. Currently my motor i'm using on it is Max 88 watts and it flies beautifully. Currently it is a Bank and Yank, but is very easy to make into a full 4 channel. using a 12A ESC and 3.7G servos, using one for Elevator obviously but then using only 1 for the Ailerons. Also to the powerpod attaches on the top of the main fuselage which allows enough space under the pod between the wing to have your battery, currently it can fit a 1000mah 3s but adding a 1/2 inch will allow close to a 2200 3S if using the bigger powerpod. If I have enough interest I will go ahead and create plans for it. Cool, these swappable series are really taking shape(s)! Cool, looks like P-47 main wings and a De Havilland vertical stab. 3.7g servos with bigger pod and battery????? suggest bumping those on up 9g. Nice build....looks like a fairly straight forward saturday after noon build and sunday morning fly sort of thing. Now if only you could find a way to put a gun on it, stuff some potato chips in it and include with the plans a Ipod.....that would get Mr. Scott's attention lol.